Official preview images for the Arrow episode "Irreconcilable Differences"
This is the midseason finale episode for Season 6! Here’s how The CW describes it; the new photos follow below. Thea (Willa Holland) is in these photos – and Oliver and Felicity celebrate just getting married at the end of this year’s crossover! 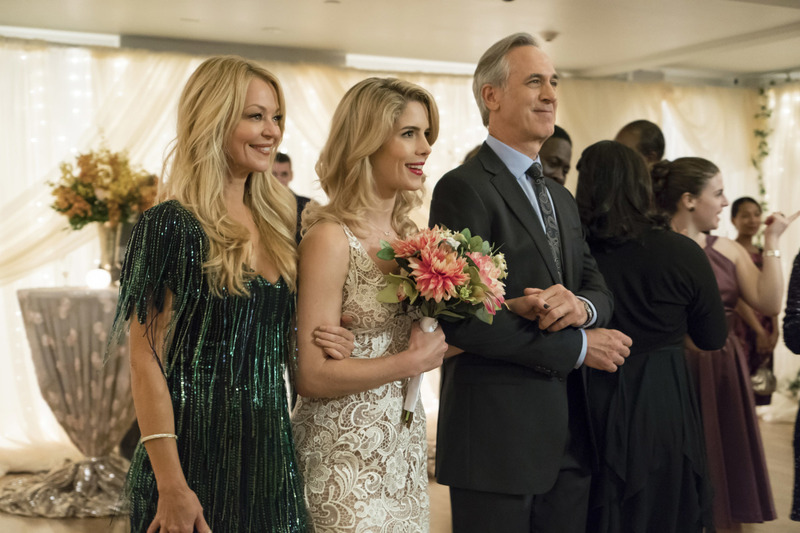 Donna Smoak (Charlotte Ross) also makes a return to the series for the first time in a while… wonder how Quentin will take that, especially since Felicity’s father Noah Kuttler (Tom Amandes) is also present. Arrow -- "Irreconcilable Differences" -- Image AR609a_0002 -- Pictured (L-R): Charlotte Ross as Donna Smoak, Emily Bett Rickards as Felicity Smoak, Tom Amandes as Noah Kuttler, -- Photo: Dan Power/The CW -- ÃÂ© 2017 The CW Network, LLC. All Rights Reserved.